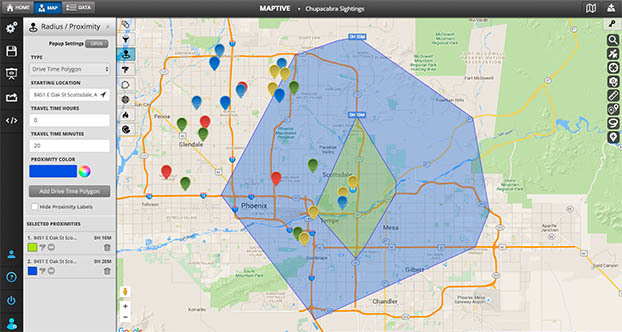 BREAKING NEWS: Google Maps has found its soulmate — in the form of Maptive’s innovative, easy-to-use mapping software. A comprehensive toolkit of interactive online mapping features, Maptive allows you to visualize your raw location data as a customized Google Map. What’s more, our mapping software is as easily navigable as the roads will be when you put our tools to use. 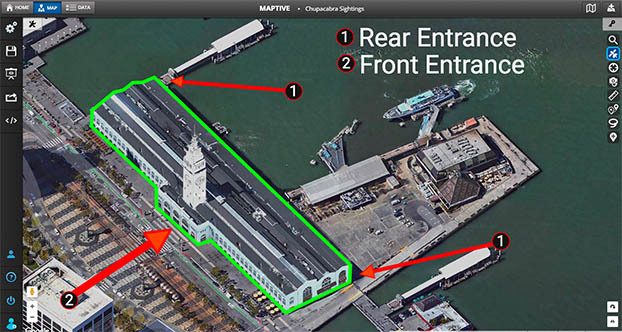 Maptive’s map making software provides navigational features to bolster Google Maps’ already powerful tools. Maptive includes handy features such as route optimization for multi-location routes —but our repertoire doesn’t stop there. We also offer state-of-the-art data visualization tools that help you see patterns in your data that may have otherwise gone unnoticed. Imagine you had a tool that enabled you to see the density of a specific demographic within a demarcated area, or how many businesses of a certain type fall within boundary lines that you’ve drawn yourself. With a platform that allows you to see this sort of geographical patterning, epiphanies await that could positively impact the bottom line of your business. 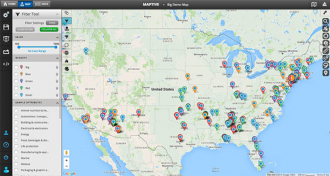 Sign up for our free map making software trial. Input your data and start playing like it’s geography class in the year 3000. Once you have become acquainted with our mapping suite, you can decide which of our plans best serve you. 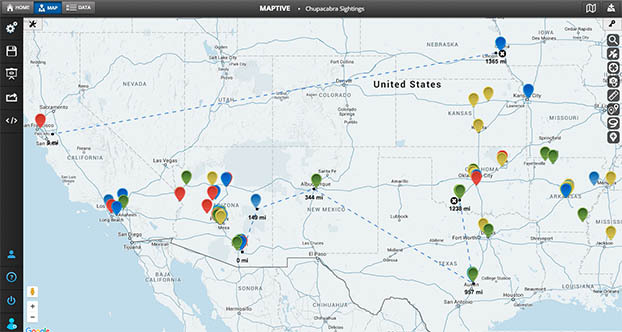 There really is something for everyone — from our free map making software option to our enterprise-ready team suite. Whether your goal is to educate or persuade, inform others or navigate your own path efficiently, there is a Maptive plan for you. Ready to zoom in? We are too. Mapping Making Software… can be this C.R.E.D.I.B.L.E. If you’ve already forayed into the world of online mapping software, you may be aware of how clunky some platforms can be. While they claim to offer efficiency, the real result is the opposite. You spend more time spewing out non-grandma-friendly words than you do navigating from one place to another or finding patterns in your data. We understand this, and because we’re all about increasing productivity and decreasing stress, we’ve prioritized usability in all elements of our platform. The result is mapping software that is intuitive, able to handle large data sets and fully customizable to your needs. Your map has two basic views — DATA and MAP. You input your location data either as a spreadsheet in the DATA view or straight from the MAP view. Let’s zoom in on that, shall we? Our maps are your maps. From the aesthetics of your map to what you would like to achieve with them, you can make your map your own. On a broader scale, this means that, whether you are an individual looking for free map making software or a large scale organization searching a sophisticated visualization solution, there’s a Maptive option for you. Head on over to your Map Settings and alter everything from what your map markers look like to whether you would like points of interest displayed. And when it comes to using our other features, from our route planner to our heat mapping tool, you will be able to change the colour and styling elements to make your map look uniquely yours. Look, we’re powered by Google’s enterprise level mapping technology. When it comes to online mapping software, that’s as reliable as it gets. Our platform prides itself on world-class sophistication when it comes to its performance. And perhaps the best part is that you won’t have to worry about frustratingly spotty coverage. That’s right, no matter where you are travelling in the world, your map will be there to guide you. We live in the clouds, which in the world of contemporary software is a good thing. 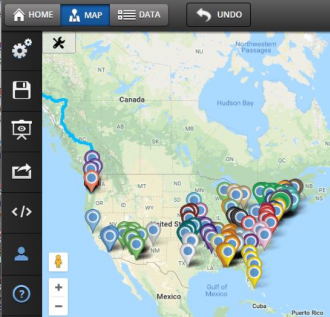 We are 100% an online mapping software — no downloads, no installation, no endless waits for new upgrades and features. It also means your data is safe with us until you decide to delete it. Have you ever tried to find a lost ring on the beach? Finding the meaning in a large set of data can feel much like that. How on earth are you supposed to see patterns in the lines and lines of spreadsheet data that all start to look the same after a while? That is why you need visualization tools that transform that data into a picture that makes sense to you. You’ll be amazed — insight will leap off your screen and sometimes right into your bank account. The estate agent can easily see where her target demographic resides. The saleswoman is immediately made aware of areas that have a high density of her customer avatars. Your mom can map out the best route to see all her cousins while avoiding the area where that dreaded Mrs. Bunyon resides. The possibilities are truly endless. Seeing your data displayed in this way may feel like putting on glasses for the first time — when you didn’t even know your sight was deficient. We’ll let you in on a little secret — mapping nerds created our platform from their own masterful (albeit slightly obsessive) understanding of online map making. 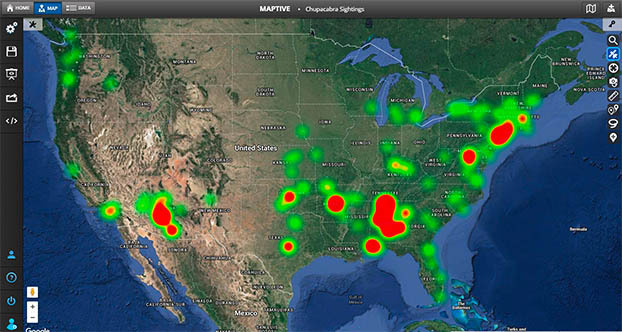 Maptive is the result: a platform that knows what you want from it even before you do. The result is the learning curve is gentle. We want our tools to aid you, not infuriate you. If you’re an aesthetics junky like we are, you won’t be able to get enough of our beautiful maps. Whether your maps are for your viewing pleasure, or a feature on the homepage of your company’s website, eyes won’t tire of looking at them. Their beauty is the result of our partnership with you. We provide the basics and you make the choices. Yes, that route DOES look gorgeous in blue. It brings out its sales targets. You can keep Maptive in your pocket. We are 100% mobile friendly. 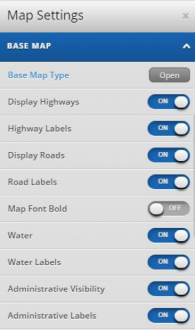 Any maps you create and share are available to you as long as you have your mobile device with you. That means you can take Maptive on the road, and it will be a far better navigator than that boyfriend of yours who could have sworn you didn’t need to turn right 20 miles ago. There is so much you can do with your maps when you are ready to set them loose on the world. Whether you want to pop them on your site, send them to a client, stick them on your office wall or simply stare at them while you marvel at their sheer magnificence, the choice is yours. Now for the next chapter. Let’s have a look at all the amazing tools in the Maptive box. Hang onto your seats because we’re about to navigate you through our comprehensive set of mapping features. 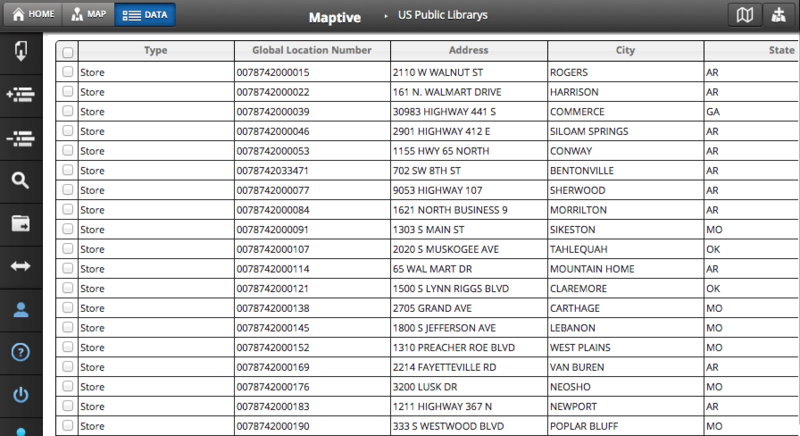 Remember the columns in the DATA view of your map? 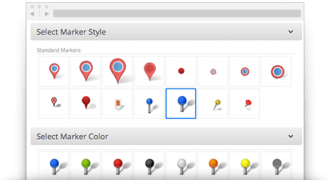 Choose any of them using the Marker Grouping Tool and Maptive will assign a colour to that location type. Say, for example, you would like to group your data by sales. Each sales bracket will be given a unique colour marker. The Marker Grouping Tool allows you to view the markers in an adjacent map legend that is fully interactive with your map. If you decide you would only like to look at sales markers between $3000.00 and $4000.00, simply select this bracket and this is all that will be shown. Choose a particular area. Use the map drawing software to illustrate a radius of a particular number of miles or kilometers from a central location. Quickly run a proximity analysis on any segment of your location data. This tool is useful in a range of different instances. Employers can decipher how far employees live from an office location. Franchisers can ensure that they do not set up a new franchise too close to another one. You can decide if you live far enough from your mother-in-law. What’s more, you can choose to export data from only within a stipulated radius. Because the ability to draw perfect circles is a sign of madness, we had to include the Drive Time polygon. Based on driving hours or minutes, the polygon asks the question of how far you could travel in a specific time frame from a chosen location. 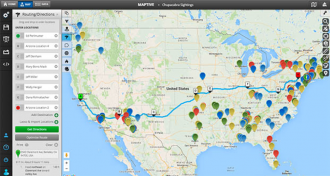 You don’t have to be a lost soul to enjoy the benefits of Maptive’s route planner. With very little effort on your part, the route planner will provide you with the most efficient route to take between two or more locations. 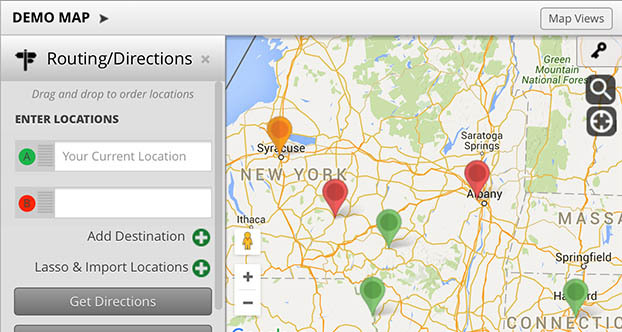 You can plan routes between any locations that already exist on your map or manually load relevant addresses. It is fully customizable and comes with a drag and drop feature that allows you to make changes on the fly. 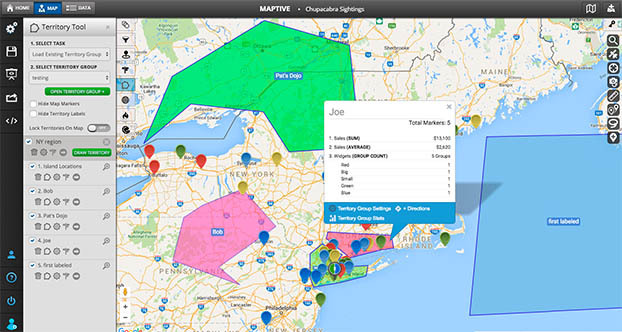 If you are looking to use Maptive to increase the profits of your business, you will quickly sidle up to the territory drawing tool. Here, you will be given the opportunity to manually draw a territory of specific interest to you, and customize its coloring. The territory is then your oyster as you are able to view data that corresponds to that region, such as sales data, number of clients, or average yearly income. Everyone needs boundaries, and Maptive helps you make them. 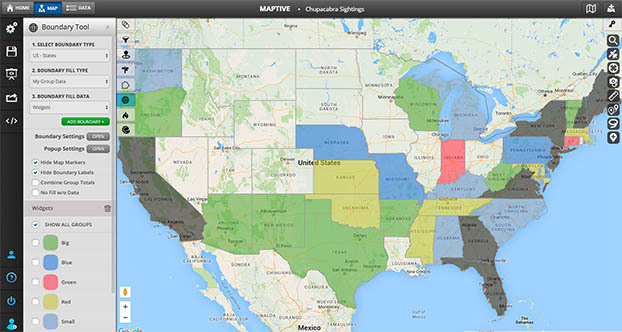 Visualize boundaries based on areas such as cities, states or zip codes. Secondary criteria — such as population, demographics or average income — about the demarcated regions can then be added to further understand trends or identify opportunities. The Boundary Tool is popular amongst real estate agents and salespeople who want to quickly understand the market in a particular area. Heat Mapping is a sophisticated way to visualize numerical data. It’s most typically used to understand market density across a map’s vicinity. 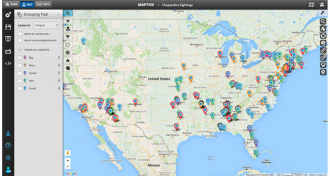 Our heat maps are fully customizable, allowing you to play around with the look and feel of your visualization. You have the option to adjust the opacity, radius, intentional threshold and the gradient colors of the targeted areas. This is the part where you really get to put your signature on the map you have created. Add text, bubbles, shapes, icons, labels and images. Upload your own 70 x 70 pixel markers so that when other people see your map, they immediately recognize it as yours. Looking to edit the data related to a specific batch of markers? 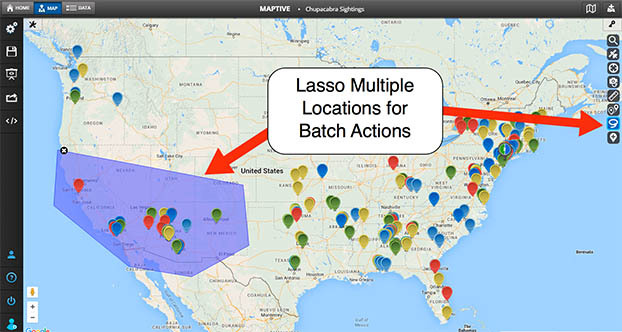 Lasso multiple locations and easily batch edit the data relevant to them. This tool also allows you to export the location data of the demarcated segment of your map. If you want to seamlessly convert your location data into an interactive Google Map, this is the tool to do it. There you have it — a quick distance calculator between your inputted locations. This one’s for the lost souls out there. Don’t know where you are? The Location Finder will tell you. But its uses don’t stop there. 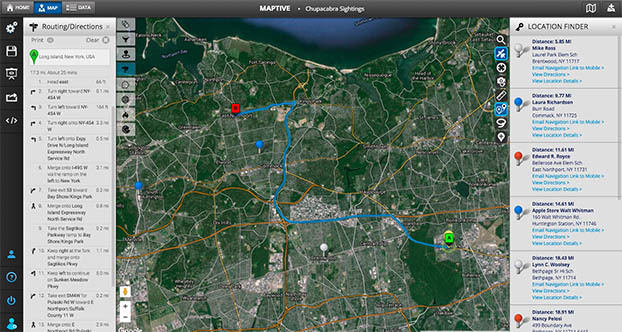 In panels on either side of your map, it will show you the details of locations close to you, and how to get to them. You have so many things on your mind. The last thing you need to be worrying about is whether or not you’ve made a wrong turn. By simply clicking a button in the popup of your chosen marker, you will open directions in your phone’s Google Maps application. Just like that — Google Maps will then talk you through your journey, like a clairvoyant commentator at a sportsmatch. 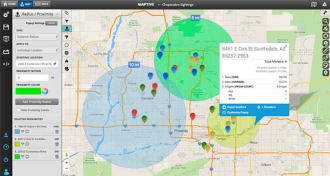 Ready to sign up our Free Mapping Software? Your mind is probably traveling at a hundred miles an hour thinking of how you will use this map drawing software in your life — but don’t let it travel too far until you have a Maptive account. You don’t want it wandering into a place of no return without C.R.E.D.I.B.L.E. navigation software by its side. Sign up now for a free trial — no credit card details needed — and see where our mapping software will lead you. We’re so glad you found us. In fact, finding things is the very thing we like best.